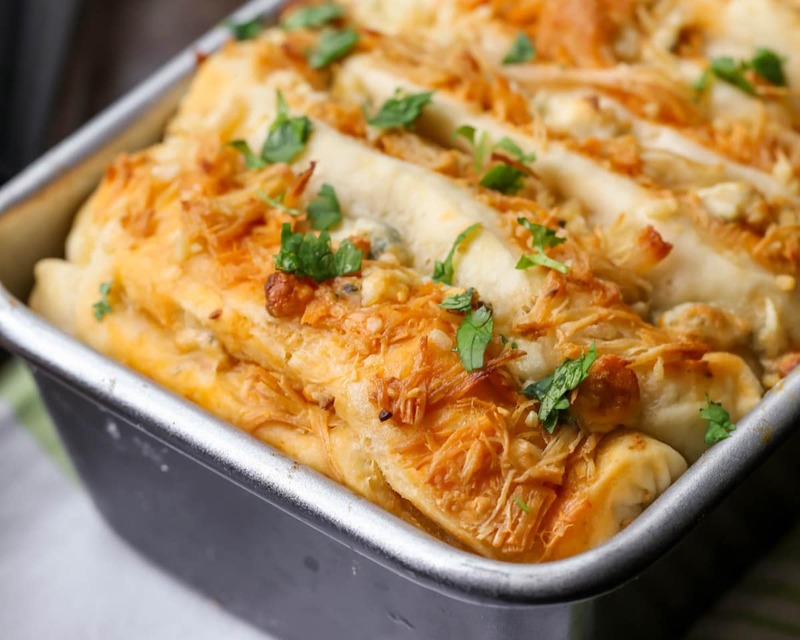 If you’re looking for a delicious bread that’s perfect for sharing, this Buffalo Chicken Pull Apart Bread is your answer! Made of bread dough sliced into pull apart pieces, covered in buffalo sauce, chicken and bleu cheese. This bread has the perfect amount of kick! 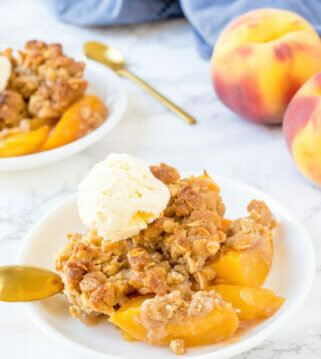 I’m skipping the pleasantries because I am soooo excited to share this amazing recipe with you today. The beauty about Tried and True is that we put so much work into all the recipes we try, and we truly do not share the ones that are just so-so. We want you to have the BEST of the BEST. Well, today’s Buffalo Chicken Pull Apart Bread is just that! I absolutely loooved this buffalo chicken bread. It was bursting with buffalo flavor and I just couldn’t stop at one slice (seriously sooo good)! We usually use butter to tame the spice in the buffalo sauce, but feel free to skip that step if you like things a little bit more spicy. Next time, we’re going to try barbecue chicken pull-apart bread. Doesn’t that sound delicious? 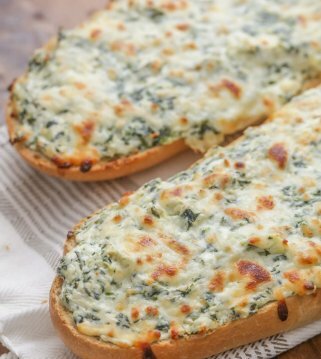 The bread itself is really good and super soft, so add all the flavor and it’s darn right addicting!! 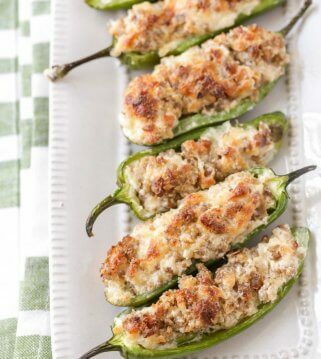 😀 If you are a fan of all things buffalo tasting, then you must try this recipe. Split dough into two. Roll out onto a floured working surface. Trim ends for two clean 4 x 16″ rectangles. 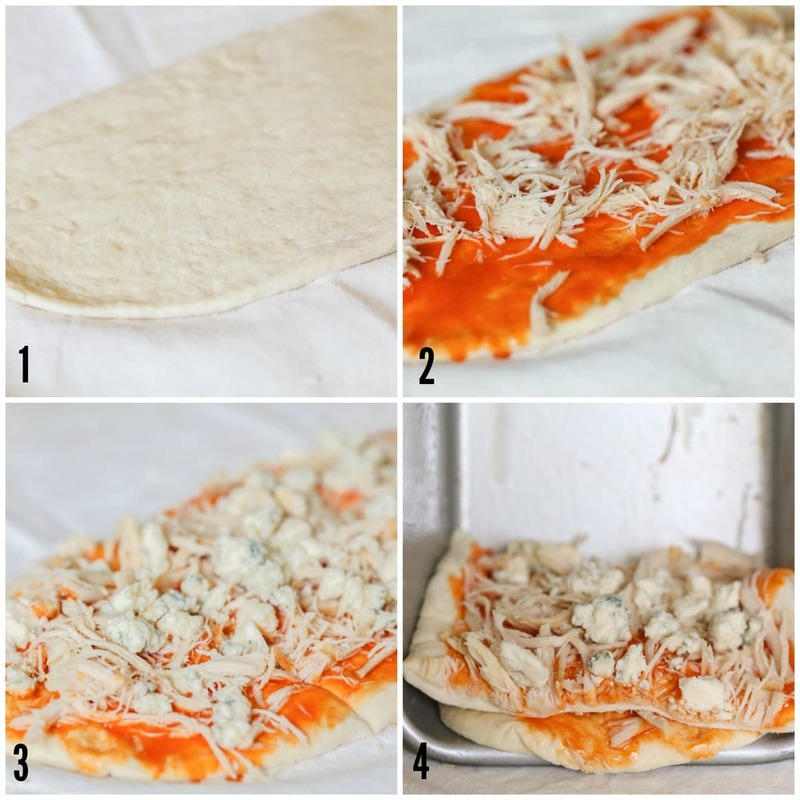 Brush dough with buffalo sauce and top with shredded chicken then crumbled blue cheese. You may use more or less than the suggested amounts, based on your liking! 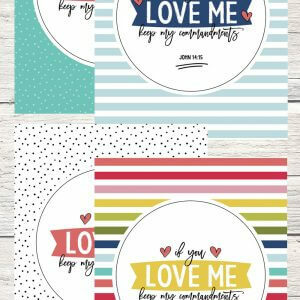 Cut into 3″ pieces. Using a greased 9″ pan, carefully stack each piece on top of each other (standing in the pan on end), by tilting the pan and adding one piece at a time. The last should be stacked so the raw edge is lined up against the pan. Bake at 350 for 15 minutes. While baking, melt your butter and mix in the minced garlic. After 15 minutes of baking, pull out and brush the top with garlic butter. Bake for an additional 18-20 minutes. 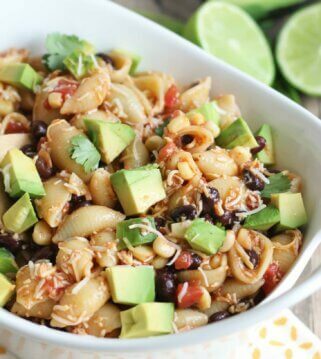 Sprinkle with cilantro and serve warm. Like we mentioned, we want to try another version of this soon but the possibilities are endless. 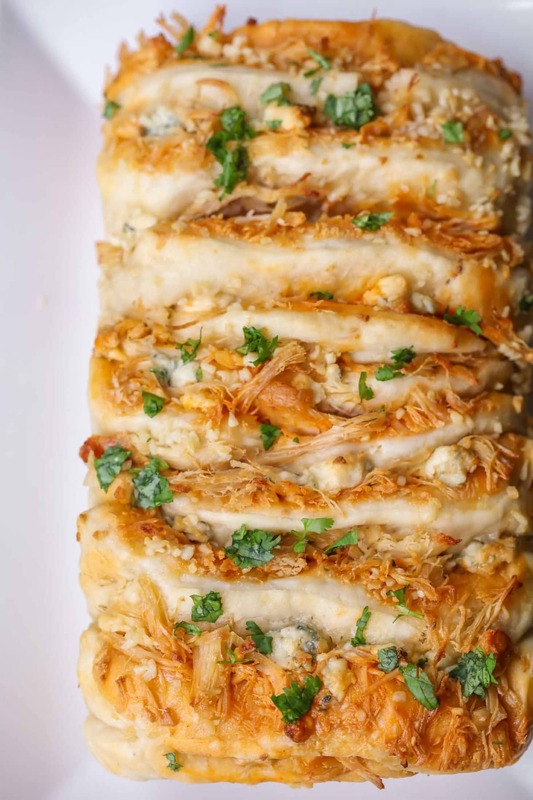 You’ll have to let us know what you think of this Buffalo Chicken Pull Apart Bread, because we loved it! 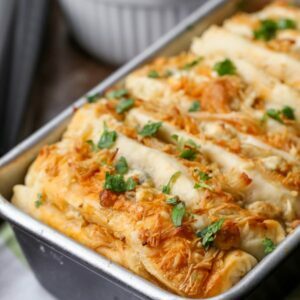 If you're looking for a delicious bread that's perfect for sharing, this Buffalo Chicken Pull Apart Bread is your answer! Made of bread dough sliced into pull apart pieces, covered in buffalo sauce, chicken and bleu cheese. 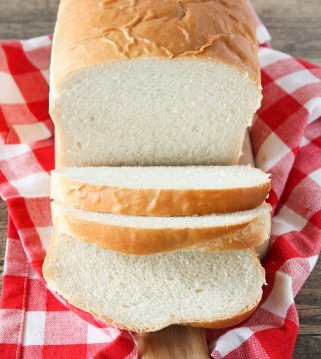 This bread has the perfect amount of kick! 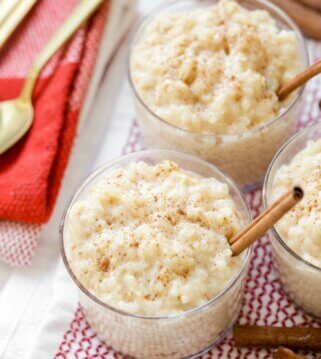 In a small bowl, mix ¼ cup water with the honey and dry yeast. Let sit about 3 minutes until the yeast starts to bubble. In a bigger bowl, combine the flour and salt. Add the oil, the yeast mixture and the remaining ¼ cup water. Mix to combine and knead the dough until it’s soft and elastic, about 5 minutes. Place the dough ball in an oiled bowl, cover with plastic wrap and let rise for 1 hour. Split dough into two. Roll out onto a floured working surface. Trim ends for two clean 4 x 16" rectangles. Brush dough with buffalo sauce and top with shredded chicken then crumbled blue cheese. You may use more or less than the suggested amounts, based on your liking. Cut in 3" pieces. Using a greased 9" pan, carefully stack each piece on top of each other, by tilting the pan and adding one piece at a time. The last should be stacked so the raw edge is lined up against the pan. While baking, melt your butter and mix in the minced garlic. 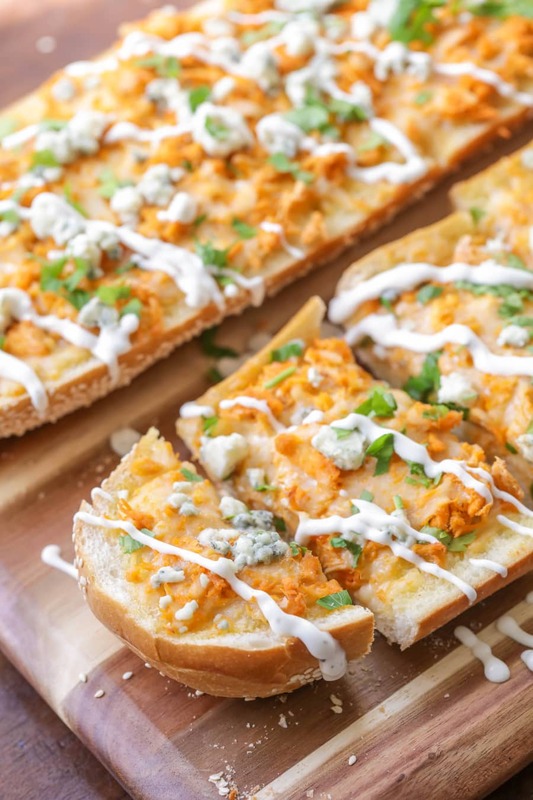 If you like this buffalo chicken bread recipe, you’ll love this one too! 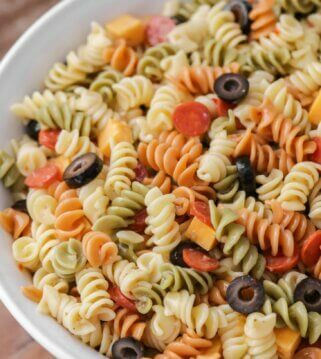 Made this recipe today and ran I to a hiccup with the water allotment. 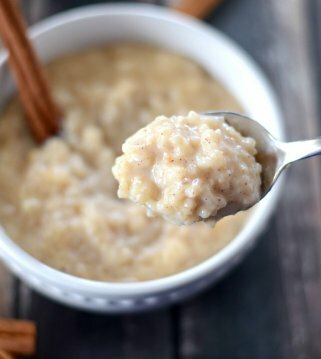 The recipe amount calls for 1/2 cup total, but the instructions say 1/4 c with the yeast and then 3/4 cup with the flour. I think that is just a typo and should be 1/4 cup, but I added the 3/4 and got mixing before realizing that it wasn’t working. I did have to start over, but Otherwise the recipe was tasty and delicious, just as expected! Yes, it should. I will fix that. Thank you so much & I am sorry you had to start over. I am glad you still liked it! !